A winning team hasn’t worked, so perhaps hard cash will help lure notoriously fickle Northern Illinois University students out to home football games. NIU announced last week a “Huskies $100s” program that would award $100 to at least 10 students every game. The more students in the stands, the more winners would be picked for awards, which would be deposited in the students’ bursar accounts. 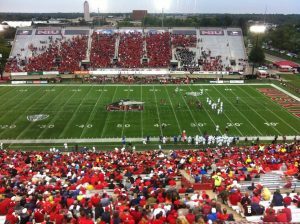 Northern Illinois averaged 11,291 in football attendance through six home dates in 2017, one of the lowest in the nation among major college program. According to a statement from NIU, if there are 1,000 or or fewer students, 10 students will win $100. For 1,001-2,000 students, there will be 20 winners. For every additional one thousand students in the stands, 10 more students will win $100. NIU students, admitted free to every athletics home event, would be automatically entered to win the Huskie $100 when they swipe their OneCard at the gates on the East Side of Huskie Stadium at each game. Winners will be drawn at random from the student ID numbers associated with the scanned one cards at each game. Winning numbers would be announced and displayed on a video board during the last timeout of the third quarter. Winners must be present to win and would meet an NIU Athletics representative to confirm their identity. Any student who does not win through the promotion but attends all five home games will be entered into a random drawing for $750 at season’s end. The Huskies open their home football season on Saturday, Sept. 8 when they host Utah, the first Pac 12 team to ever play at Huskie Stadium.